Barcelona head coach Ernesto Valverde said he does not care about a contract extension as he dismissed speculation over his future with the LaLiga champions. 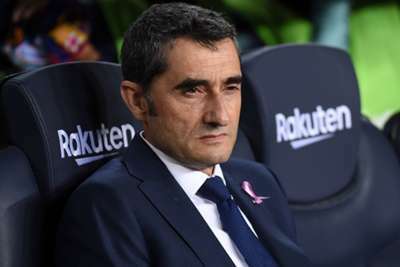 Valverde's deal expires at the end of the season and the 54-year-old has continually been unwilling to speak about a new contract. The former Athletic Bilbao boss secured a domestic double in his first campaign in charge but Barca suffered a shock Champions League quarter-final exit to Roma in 2017-18. Valverde was asked about his future again following Barca's 4-2 win over Sevilla on Saturday, however, he preferred to focus on upcoming clashes with Inter and fierce rivals Real Madrid. "My future at Barca does not matter to me, I do not care," said Valverde. "I'm focused on the two matches that come and the noise that there is always around the team is the usual and you cannot do anything." Barca's triumph against Sevilla in the top-of-the-table clash came at a cost after Lionel Messi fractured his arm at Camp Nou. The Catalan giants – who are a point clear atop LaLiga – will host Inter in the Champions League on Wednesday before entertaining Madrid in Sunday's Clasico.